Got an e-mail from an address I didn’t recognize. 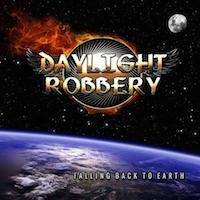 Would I like to review the new album by melodic AOR rockers Daylight Robbery, it said. As fan of both AOR and melodic rock, it would be stupid not to check it out, of course. I had never heard of the band before so before I started to write this review, I decided I needed to do some research to see who the hell this lot were. Well, easier said than done, I brutally found out. To say that there is a shortage of information of this band out there is a understatemant if there ever was one. Their Facebook page didn’t give much away and when I clicked the link to their home page all I got was the band members’ names – Tony Nicholl (vocals), Mark Charlton (guitars), Colin Murdoch (bass), Chris Miller (drums) and newest member David Billingham (keyboards), that they come from Birmingham, Great Britain, that their debut album Cross Your Heart came out in 2011 and that they call themselves “The New Kings Of Heavy Melodic Rock”! Ok. But see, I want to know more about the band and the band members – if they have played in other bands before, influences etc. Hell, I don’t even know which year this band started. I’m sure I could find out things like that if I searched hard enough, but if you want to promote yourself properly, no one should have to search hard, all that kind of information should be right there on their home page. Oh well, enough about that, let’s see if this bunch of melodic rockers delivers the goods musically instead. It’s always interesting to find new music, especially melodic rock and AOR. Why? Well, because that kind of music depends much on, not originality, but identity. In 2014 you really need something, just a little, that sets you apart from the other acts. If not, you lose me on the spot. I love this kind of music, but to be honest, there are way more crappy bands in this genre than good ones. That said, hit me, boys! “Enter The Arena” is an intro that creates an atmosphere before the opener “Scream Outloud” kicks off. It’s a big song, riff happy, but very melodic. It reminds me of a more bombastic and poppy Demon. This is really good stuff. “I’ll Be Seeing You” is one of those magnificent AOR pearls that gushes over you like a hot summer breeze. Poetic, huh? But that’s the way it feels. If you want AOR at its best, then take a listen to “Samarah Never Sleeps”. This is a smash hit, well at least it should be. Killer stuff. “Redlights” kicks in with some rocking melodies and a distinct chorus that nestles itself under your cerebral cortex, “Hungry Years” comes on with some great Magnum-esque pomp rock and “Between The Lines” is a fabulous ballad that makes me think of Walk In The Fire era Strangeways. It’s a super song, but why the programmed drums? I am not a fan of those! “Running out Of Time”, the album’s closing track, might just be the best song on the whole album. The rhythm guitar and the Hammond sounding organ makes my mind wander off to old 70’s Deep Purple days and the catchy melodies is really addictive and the chorus glistens – Bravo! This is what I’m talking about. See, Daylight Robbery hasn’t reinvented the wheel by any means, but at the same time, they do not sound exactly like every other AOR band out there. I can’t really put my finger on it, but there is that little something that makes this band stand out. It might be that they have something of their own, an identity if you will, but for the bigger part, I guess it’s just that almost every song on this album is so damn good. They also show off a really good singer, a brilliant guitar hero to be in Charlton and some really big keyboards. The keyboards, yes – what I like about them is that they’re quite heavy and not so pink and fluffy like AOR keyboards has a tendency to be. The only thing I have a slight objection to is the production. While it’s not bad, I still would want it fatter and bigger – more substance as it would affect the dynamics positively. The guitar could be louder as well, higher in the mix. A guitarist like Charlton should be heard. Other than that, I find this a great album and with the “New Kings Of Heavy Melodic Rock”, well, be that as it may, but for the AOR – lover, this is a must.